■ Little material is required for botulinum toxin injections. The ampule contents are dissolved in 2.5 ml of a non-preserved saline solution. The suction of the syringe plunger is evidence of the vacuum inside the ampule. ■ For the injection, we use a convention insulin syringe with appropriately fine graduations (4 U of botulinum toxin correspond to 0.1 ml). It is recommended that the novice use syringes with a volume of 0.3 ml so that the dosage of the injections can be even more accurate. ■ The injection is made directly into the center of the muscle with a 30-Ga cannula. In the forehead and glabella regions, it is recommended that the injection be made at an angle of 90°, vertical to the periosteum. The syringe is then pulled back slightly until the center of the muscle is reached. The material, usually 0.1 ml, is then injected. The injection quantity is lower/fewer units are injected in the perioral and periorbital areas, i.e., 2-3 U. ■ The marking of the injection sites prior to the operation is particularly important if adverse side effects are to be avoided. The injection must be made under sterile conditions following prior careful disinfection. ■ In women with highly arched eyebrows, the muscles of the forehead are not highly developed. 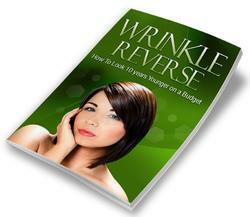 They have a lower mass and therefore only a small amount of Botox is required for paralysis. 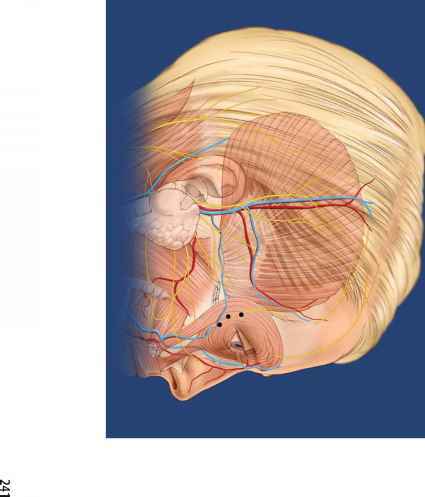 The fixed points for the injection in such cases are the midline between the two eyebrows, and on the vertical line from the inner canthus to the upper margin of the osseous orbit as well as 1 cm cranial to this. ■ In women with more horizontal eyebrows, the muscles are more highly developed, and a slightly larger quantity of botulinum toxin is therefore required. Additional injections can be made 1 cm above the osseous margin of the orbit in a line running from the middle of the pupil in a cranial direction. There is a danger of ptosis if material is injected lower than this. ■ In patients with pronounced horizontal wrinkles caused by the activity of the frontalis muscle, the injections are made along an imaginary horizontal line between the eyebrows and hairline in the vertical line running from the pupil in a cranial direction. Further injections are made between these two points. Additional sites can be defined individually depending on muscle activity and the depth of the wrinkles in the forehead area. Eyebrows that appear too straight and droop at the sides can be lifted with injections. In this procedure, botulinum toxin is injected into the upper lateral section of the orbicularis oculi muscle at a site close to the orbital margin, 1-2 cm above the lateral corner of the eyelid. 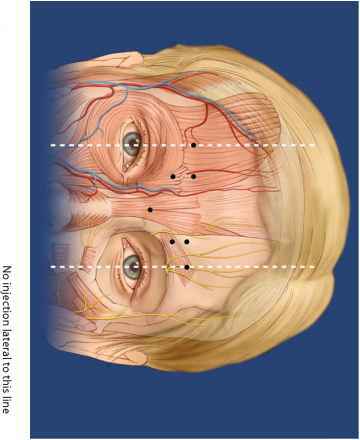 Applying a counterpull to the frontalis muscle causes slight raising of the lateral eyebrow. ■ Crow's feet are treated with one injection 1.5 cm lateral to the canthus and two injections cranial and caudal to this point. The osseous orbit serves as a point of orientation. Tensioning of the orbicularis muscle can sometimes create a tense or bitter facial expression. By injecting Botox into parts of the ring muscle, this can be modified to give the patient a more friendly facial expression. The injections are made directly below the edge of the lower eyelid in the mid-pupillary line. During the injections, the patient should have his or her eyes open and be looking upwards. ■ Depending on how vigorously the orbicularis oris muscle is contracted, 2-4 injection sites are distributed in a line along the lip margins, i.e., one point lateral to the philtrum on the left margin of the lips and one on the right, and one further point. ■ Furrows develop over the years as a result of the pull of the depressor anguli oris muscle and these run from the corner of the mouth in a caudal direction. The injection is made into the center of the muscle, which can be identified by palpation, approx. 1 cm lateral and 1 cm caudal to the corner of the mouth. 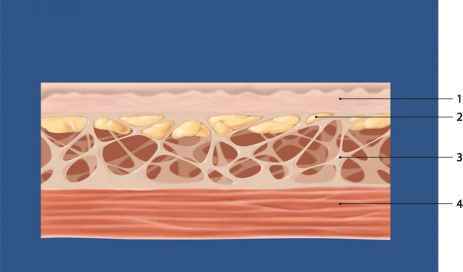 ■ If the skin is highly elastotic, contraction of the mentalis muscle may result in the chin having a "cobblestone" appearance. Botulinum toxin (0.1 ml) is injected at two paramedial injection points, approx. 0.5-1 cm above the tip of the chin. ■ Twenty units of botulinum toxin, injected into the procerus muscle and the middle of the corrugator supercilii muscle, divided into several individual doses, are sufficient to smooth "anger wrinkles." To reduce the activity of the frontalis muscle, treatment should be with a total dose of around 16 units per session. The treated areas are compressed briefly after the injection. The patient must then keep his/her head upright. ■ Three units of botulinum toxin per injection site are used to smooth crow's feet in the area of the eyes. In the perioral area, 1-2 U are injected per injection site with the needle at an oblique angle, inserted only slightly and pointing in a cranial direction. ■ To lift the corner of the mouth, 3-5 U are injected into the center of the depressor anguli oris muscle. The center is identified by palpation. In the chin region, 3-5 U injected at two injection sites in the area of the mentalis muscle will be sufficient to achieve a smooth appearance. The injection should be vertical and in the direction of the periosteum. When treating the submental region, the platysma should be contracted and held between the thumb and index finger (platysmal bands). Four units of botulinum toxin are injected subcutaneously, directly into the platysma at intervals of 1 cm with the needle at an angle of 45°. There are many indications for the use of botulinum toxin and the aesthetic surgeon must gradually push the boundaries to be able to achieve good results without risks. A 37-year-old patient with pronounced forehead mimicry. Injection of 1.0 ml botulinum toxin in the forehead area following prior marking of the injection site. Findings 3 months after treatment.